Pradhan Mantri Jan Dhan Yojana PMJDY The scheme was launched by PM Narendra Modi on 15 August 2014. Slogan of the Scheme is “Mera Khatha, Bhagya Vidhatha ( it means “My Account brings luck to me” ) Prime Minister Jan-Dhan Yojna. 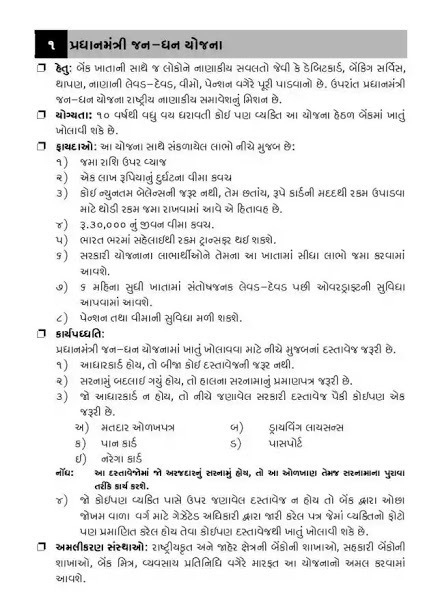 Gujarat State Also Available PMJDY. Due to the preparations done in the run-up, as mentioned above, on the inauguration day, 1.5 Crore (15 million) bank accounts were opened. With the bank account, people are given access to financial facilities such as Debit card , Bank service , Deposit, money transfer, insurance, pension etc. are required. Ministerial minister The Jan-Dhan Yojana is a national financial inclusion. Any person with a maximum age of 10 years in the bank under this scheme Can open. 2) Insurance cover of one lakh rupees. 3) No minimum balance requirement, however, as well as withdrawing money using the card For this, a small amount is deposited. 4) Life insurance cover of Rs. 30,000. 5) The amount of transfer from India will be transferred to India. 6) Beneficiaries of the government scheme will be credited directly into their account Will come. 7) 6 months after the financial transaction in the account of the overdraft Will be given. 8) Pension and insurance coverage will be available. The document is essential for the expansion of the Prime Minister’s Office. 1) If there is a Aadhar card, no other document is required. 2) If the address has changed, the address in the existing address is required. 3) If the Aadhar card is not there, any one of the following government documents Required. Note: If these documents contain the address of the applicant, then this identity and address proof As it would be. 4) If any Person does not have the above document, then less by the bank Photo of a letter issued by the Registered Magistrate for the risk category. But can also be removed from any document that is authenticated. The branches of nationalized and public sector banks, co-operative banks Implementation of this scheme on branches, banks, business, etc. Will come.